It was a gray, windy, wet afternoon in New York City. 1977. I was walking quickly, squinting against the fine, cool rain. Lower Broadway was more-or-less deserted. It was October and it felt like October...in fact, it felt like Halloween. A sudden gust flung the rain into my face, and I turned away...to find myself looking into the dimly lit window of a used-book store. I hadn't planned to stop; I had some urgent, forgotten errand at hand. But I was intrigued - as I always am - by the air of shabby mystery one often senses in old book stores and junk shops. Besides, I wanted to get out of the rain. I opened the door and walked in. The shop was dusty (no surprise! ), with disorderly stacks of battered books on the wooden counter. On the floor were corrugated boxes full of old magazines and phonograph records. In the back of the narrow shop stood tall bookshelves, crowded to overflowing. A slight, elderly man appeared from behind them. 'I'd just like to look around for a moment," I answered. 'No, no....' I bent down to thumb through a few of the old LPs. A familiar cover caught my eye: a worn monaural copy of Van Dyke Parks's Song Cycle. 'This is an old favorite of mine." 'Ah. Well then, you might be interested in this.' Without a moment's hesitation, he walked over to another of the boxes, reached down and pulled out a magazine in a plastic sleeve. He presented it to me, peering over his spectacles. It was an old issue of Rolling Stone. I had read the magazine regularly in its early days, but had given it up years before. More out of courtesy than any genuine interest, I glanced at the cover. And then courtesy was forgotten, and I was suddenly more than interested in this particular issue. Because there was something very wrong with it. On the cover was a photograph - one I'd never seen - of the Beach Boys. 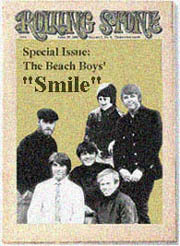 And below the photograph, in headline-size type, were the words: 'Special Issue: The Beach Boys' "Smile" - A Review.' I looked up at the date on the cover: May 12, 1967. Impossible, of course. There was no Rolling Stone review of SMiLE in 1967, because there was no SMiLE in 1967. This had to be a clever forgery - an obsessed fan's bit of wishful thinking, made "real" in newsprint and graphics. And yet...the forgery was too good. The dog-eared pages, the perfect yellowing of the paper: it all seemed quite real. As long as I can remember, I've been guilty of missing opportunities by thinking too much about them. I've passed on stocks that later quadrupled in value, I've been left out of more than one real-estate boom, I've talked myself out of accepting job offers that would have changed my life. I handed him a five-dollar bill and waited while he put the magazine into a brown paper bag and handed it across. I was reaching out to take my change when I thought better of it. He grinned and winked. Was he saying a simple thank-you...or letting me know that he was in on the secret? I didn't know then, and I don't know now. You can probably fill in the rest of the story for yourself. The magazine is, to all appearances, completely genuine. Every article, every advertisement, every photograph is absolutely right, absolutely perfect for its time. I made inquiries. Was this some well-executed fake, circulated privately among SMiLE fans? No. Was it some kind of early mock-up, smuggled out of the offices of the magazine? Again, no. Over time, I have come to accept that it is exactly what it appears to be. I went back, of course. I went back the very next day. It was a brilliant, sunlit afternoon. It was October, but it felt like May. I couldn't find the bookstore, though I crossed and re-crossed the streets. There was no point in searching the phone book; I hadn't taken notice of the shop's name to begin with (do shops like that have names?). I gave up, in the end, and went home. For almost thirty years I've kept this story a secret; I'm not entirely sure why. Now, with SMiLE scheduled (again!) for imminent release, I've decided to share it. And I've decided to share the SMiLE review as well. In some other world - a world into which an elderly shopkeeper was able to reach, one rainy afternoon long ago - the time for SMiLE came in 1967. In what we call "our" world, the time for SMiLE is right now, this very minute. It's right and fitting and proper for others, finally, to read this review. I hope you enjoy it. The following is taken verbatim from the magazine. I have resisted the temptation to correct misquoted lyrics. If the writing is a bit cumbersome - if there is a faint straining to establish intellectual credibility or social "relevance" - well, those were the stylistic faults of a younger time. Let them pass; we would ask the same clemency for our own youthful excesses. What else was in that issue, you ask? Never you mind. The Beach Boys are one of the stranger stories in the history of rock. Beginning in 1963 – in an America whose shores were yet to feel the tread of a Beatle bootheel – they created a unique musical style, a true California-nature-youth idiom. Although it has evolved over the years, that style is now dated – perhaps in a sociological sense more than a musical one. The Beach Boys' music has always, ultimately, been about escapism – in the early days, escapism into the California young-white-man culture of cars, surf and girls. The times have been a-changin', of course, and that sort of music now belongs to an Eisenhower pre-history. The challenge for the Beach Boys, over the past few years, has been to remain relevant, while building on their undeniable strengths. In reality, that has largely been a personal challenge for Brian Wilson, the driving creative force behind the group. One approach might have been to abandon escapism in favor of a heightened social awareness. Instead, the Beach Boys have seemingly sought out a different kind of escape – not into "fun, fun, fun," but into pure introspection and inward-turning emotionalism. This was first heard on their early song "In My Room," but its ultimate expression was the Beach Boys' previous record, the masterful "Pet Sounds" – arguably the highest development of romantic rock writing and arrangement. If "Pet Sounds" had a flaw, it was an occasional lapse into overly lush production; sociologically, the group's escapist stance was very much in evidence throughout. Life itself is often an existential, but finally foolish, denial of reality – the reality, for example, that Hawthorne and Watts are located in the same state, but in completely different worlds. It is hardly surprising, then, that art, which mirrors life, can also become a schizophrenic form of such denial. What is surprising, however, is the ambition behind the new album, “Smile.” This record is more than the next giant step in the evolution of the Beach Boys; it is an attempt to move the entire rock genre forward, to break through traditional boundaries into new and uncharted territory. Last year, Wilson's own comments made clear that the forthcoming Beach Boys album (then tentatively titled "Dumb Angel") would be something special. He announced his intention to create "a whole new form of music...religious, white, spiritual music." He went so far as to call "Smile" a "teenage symphony to God." Make no mistake, "Smile" is nothing less than a total production-conceptual album, broad in scope and sweep, innovative in form. A collaboration with the gifted young lyricist Van Dyke Parks, "Smile" can be viewed as Wilson's personal response to Lennon and McCartney's recent releases: the superb "Revolver" LP, and the new – and more experimental – "Strawberry Fields Forever"/"Penny Lane" single. This is a breathtakingly risky step, particularly for a group that has not been seen, until now, as an exponent of the avant-garde. While one believes, somehow, that the Beatles' fans may be willing to follow them down virtually any path of musical experimentation, the same cannot be said for the fans of the Beach Boys' older music. Even “Pet Sounds,” which was at heart a traditional album, has so far been something of a disappointment in terms of record sales. “Smile” is a true rarity – an all-or-nothing artistic gamble. Structurally, "Smile" delivers on Wilson's bold “symphony” promise. Classical-music scholars may wince, but it's probably as accurate to refer to "Smile" as a symphony as anything else. The reality is that rock lacks the vocabulary, at this point in its evolution, to describe "Smile." The album is a kind of song-cycle, divided into three separate suites. Each suite is made up of several songs, song-sections, or other sonic elements, often of dissimilar styles, even genres. Musical and lyrical themes and motifs are interwoven throughout, and the transitions within each suite (sometimes within each song) show a high level of studio craftsmanship, although some are more successful than others. This is truly groundbreaking stuff: an architecture of fully-composed sound-structures that is, at once, both formalist and open. “Smile” is nothing less than an attempt to break away from traditional rock song forms. Rock artists have done plenty of singing recently about breaking boundaries – last year's Byrds song "Fifth Dimension" is one example. When it actually comes to breaking through the limits of the conventional pop-song paradigm, however, "Smile" goes where few have dared to tread – although last year several artists began, tentatively, to explore this terra incognita. Dylan gave us "Sad-Eyed Lady of the Lowlands," which occupied all of "Blonde On Blonde's" fourth side; but that was, for all its surreal glory, nothing more than an expansion of a traditional Dylan verse-and-chorus song. The Rolling Stones' "Aftermath" offered "Goin' Home," but that was an extended blues jam, pure and simple. The Beatles have never aspired to participate in this field, preferring a more improvisational, more ad hoc approach. The Doors' Oedipal psychodrama "The End" is, perhaps, as far as anyone had gone – until Wilson and Parks went further. One must look for the antecedents of “Smile’s” compositional structure elsewhere – in the work of Bacharach, Spector, even Ives or Gershwin. Conceptually, is "Smile" a "teenage" album? Maybe, but not in the way a fan of "Surfin' U.S.A." or "Shut Down" might expect. In part, the album seems to describe (and embody) a retreat, or escape, from adult concerns, into a simpler childhood existence. Co-existing with this inward-turning theme is another, more serious theme, embracing the imagery and cycles of American history. This is, in fact, a decidedly "American" album from beginning to end. Even the packaging underscores this fact, with its cover painting of an old-fashioned Main Street storefront stocked with disembodied "smiles," and an included booklet of illustrations – calling to mind rebus-puzzles – that use various other American symbols to interpret Parks' lyrics. This outward-looking historical theme, notably, is also modulated through a child-like sensibility; viewed in its entirety, therefore, “Smile” can be seen, on one level, as the latest and most extreme development of Beach Boys-escapism. As for the notion of "Smile" being addressed to God, there is unquestionably a strong spiritual thread running through the entire record; it literally begins and ends in prayer. While there is obviously a great deal going on in these grooves from a thematic standpoint, it is not entirely clear that the album is as great a conceptual breakthrough as it is a structural breakthrough…or that all of its themes are, ultimately, effectively combined into a unified and successful whole. In purely musical terms, “Smile” is not strictly a rock album at all, but a species of avant-garde composed pop, with undertones of chamber music, big-band, Broadway show tunes and jazz. A restlessly adventurous spirit pervades the record, seemingly daring itself to ever-greater heights of experimentation – heights which it often surpasses mere minutes later. The diversity of instruments, voices and sounds used on the record is staggering, encompassing – along with the soaring harmonies that have always been a Beach Boys trademark – tack piano, theremin, marimba, woodblocks, pennywhistles, clarinets, banjo, strings, animal sounds, hammers and power drills. Significantly, Wilson deploys these resources in the manner of a classical composer, "scoring" each song or section for the appropriate instruments. In contrast, the Beatles have traditionally used additional instruments as embellishments to the basic guitar-rock group lineup. Wilson has moved ahead of the Beatles here, although "Strawberry Fields Forever" shows signs of a more mature, more organic style of arranging. It's noteworthy, also, that "Smile" allows the vocals to remain front and center as the most prominent single element; the value of this vocal-oriented approach is that it keeps the melodic content at a sustained high level. The result is thoroughly listenable; while the orchestrations and arrangements are occasionally dense and complex, "Smile" remains surprisingly accessible – kaleidoscopic, mesmerizing and tuneful. To analyze the music alone, however, is to analyze only half an album, because Parks is a full partner in this audacious enterprise. His lyrics are remarkable. By and large, they do not have traditional first-person speakers, identifiable individual viewpoints, or linear narrative content. Instead, they work like "machines made out of words" (to borrow a phrase from William Carlos Williams): image is juxtaposed with image, phrase placed next to phrase, and, as if by alchemical reaction, meaning emerges. Allusions to other songs, multiple-layer puns, endlessly inventive wordplay – it's almost as if the lyrics have written themselves, autonomously generated by the language. Perhaps the lower-case "i" in the otherwise capitalized album title is a clue to Parks' method. To be sure, these are not, in Dylan's phrase, "finger-pointing songs"; they bespeak the distance of written history rather than the immediacy of social commentary. But while the lyrics do not judge or indict, they are not vapid or superficial. If they seem, at times, to veer close to nonsense psychedelia – if they occasionally give the impression of indulging in cleverness for cleverness's sake alone – they are still, when they work (and that is most of the time) among the best rock has produced. The first suite begins with "Prayer," a short, wordless, a capella piece intended, one assumes, to establish the spiritual aspirations of the entire album. The harmonies are stunning. From there, the album continues into "Heroes And Villains," presented here in a version different from the recent 45. Heavily influenced by Marty Robbins' "El Paso," "Heroes And Villains" is a fractured cowboys-and-Indians tale that manages to remain emotionally involving while dispensing with conventional narrative. It amounts, almost, to a Cubist deconstruction of a wild-west children's story; the childhood-retreat aspect of the album is strongly in evidence here. While the lyrics refer to the American west as the "Spanish and Indian home," and while they invoke the classic image-vocabulary of the frontier, they do not confront the historical exploitation of the west's native peoples; that is not "Smile's" approach. Musically, the song is a patchwork, a suite in miniature, with jarring transitions from section to section (including an interlude set in a cantina, ending with a shouted 'You're under arrest! '); but the overall old-west feeling is sustained, and the meticulously-arranged vocals are superb. "Do You Like Worms" – the title, curiously, appears nowhere in the lyric – takes a similar approach to colonial expansion into the Pacific: "Once upon the Sandwich Isles/The social structure steamed upon Hawaii." But, again, this is strictly suburban-junior-high history, without a moral viewpoint as such – although the recurring chorus chant, "Rock, rock and roll, Plymouth rock roll over," hints at an overturning of the "rock" on which American society is built. Voices imitating a train whistle usher in the rather slight "Barnyard," featuring obviously childlike lyrics about cavorting on the farm, set to a sing-song melody punctuated by the group members' imitations of various farm animals. The song sets a thoroughly pastoral mood, and it has a very real off-kilter charm, but we're forced to ask: is this irony, or the depiction of a rural, Rousseauian life of simplicity, or something else altogether? Next comes a brief instrumental version of the 1950's pop tune "The Old Master Painter," leading into a one-chorus rendition of the old standard "You Are My Sunshine." The latter song is given an interesting, mournful reading, along with an unexpected lyrical switch to the past tense. It ends with a descending string figure that suggests a sunset – the sunshine literally being "taken away." Fittingly, "Cabin Essence," which concludes the suite, begins with the lighting of a lamp. This is one of Brian's finest achievements. It is profoundly inventive, both musically and lyrically: "Lost and found you still remain there/I'll find a meadow filled with reindeer." The chorus is a layered, orchestrated cacophony, an innovation accomplished here more artfully than in "Tomorrow Never Knows," which essentially abandons melody in order to achieve its effects. Piano and banjo underscore a solo vocal that is gentle, but brilliant. We are surrounded by waves, but they are not the waves of the early surfing songs – they are "waves of wheat," and the lonely vastness of the prairie is perfectly rendered in sound. True to the album's concept, this is, again, a child's view of history: the opening of the American west and the building of the railroad. Children's songs are quoted throughout – "Home On The Range" as well as "I've Been Working On The Railroad." The ending is a majestic fade, featuring a splendid, atmospheric Mike Love vocal on the repeated lines "over and over, the crow cries, uncover the cornfield." If the first suite is sweeping in scope, the second is intimate. Where the first suite ranges across continents, the second seems to be set in a hushed forest; where the first suite spans centuries, the second seems to focus on the human lifetime. These are very personal observations of childhood and adulthood. This is the closest "Smile" comes to the introspection of "Pet Sounds" – and the closest it comes to achieving a relaxed and natural synthesis of innocence and sophistication. The first song, "Wonderful," is a deceptively simple piece about the journey of a young girl ("One golden locket/Quite young and loving her mother and father") from innocence to experience. The music, dominated by harpsichord, matches in mood the mysterious, haunting lyrics. "Wonderful" blends smoothly into "Song For Children," with its pared-down, nearly monosyllabic lyrics and surprising tempo shifts. This in turn gives way to the moody "Child Is Father Of The Man" (the title alludes to Wordsworth), a largely instrumental piece built around a brilliantly-arranged group-vocal chorus. The final song of the second suite (and of the first side) is "Surf's Up," which was widely praised when Brian played a solo piano version on a recent television special. The title seems to look both forward and backward, validating, but also reinventing, the group's surf-music ethos: surf's up, indeed, but this time "aboard a tidal wave." Here lyrical minimalism gives way to complex, almost Baroque lyrics: "Hung velvet overtaken me/Dim chandelier awaken me/To a song dissolved in the dawn." In the lyric "Columnated ruins domino," the album again touches briefly on a serious theme – the decay and fall of civilizations – and finds redemption, finally, in the simplicity of childhood: "Come about hard and join/The young and awesome spring you gave." The song ends, appropriately, with a reprise of the "Child Is Father Of The Man" chorus, celebrating the triumph of innocence over decadent worldliness. Melodically, "Surf's Up" is original and beautiful, and Brian's vocal is stunningly pure. When people ask whether there is true greatness in rock, play them "Surf's Up." They won't ask again. The third suite, which takes up the entirety of side two, is the most ambitious – and problematic – of the three. It's stylistically diverse, the thematic focus is rather diffuse, and motifs from the other suites are interwoven throughout, more or less haphazardly. It begins with "I'm In Great Shape," a jaunty, brief song that celebrates "the great shape of the agriculture" as well as the traditional southern breakfast of "eggs and grits." In a world where "south" equates, for many of us, with Meredith's Mississippi, and where America's agriculture is in anything but great shape, this may be faintly disquieting; but, again, social commentary is not the aim of "Smile." From there, we make a rather abrupt transition into a straightfaced (but abbreviated) cover version of the Sinatra/Bennett standard, "I Wanna Be Around." "I wanna be around to pick up the pieces," sings Brian – and then the song ends, drowned in a cacophony of hammers, saws and power drills. It's difficult to say exactly what's going on here. It may be nothing more than the obvious musical pun: quite literally, the sounds of a "broken" heart being put back together. Then another jarring shift, into a song called "Vega-Tables" (there's no evident reason for the odd spelling). Another paean to the field and the garden, this is a trip straight back into childhood: "I tried to kick the ball but my tennie flew right off/I'm red as a beet cause I'm so embarrassed." As if that weren't enough, there's a decidedly strange middle eight in which a parent urges a child to "eat a lot, sleep a lot, brush 'em like crazy." "Holiday" offers another child's-eye view of history. If "Heroes And Villains" is a Disney wild-west adventure, "Holiday" comes straight from a pirate movie, complete with a spoken bridge that includes the words "the men will share some sport, me hearty." The "Plymouth Rock" chorus of "Do You Like Worms" is reprised here, suggesting a link between the Pacific and the pirate Caribbean. The lead vocal follows a rollicking clarinet melody, and the overall effect is pleasant, if undemanding. Brian sings "Long, long ago" as a lead-in to a tinkling piano/marimba piece which imitates the sound of "Wind Chimes" – the next song in the suite. If other "Smile" lyrics are obscure, these are straightforward – "Close your eyes and lean back/Listen to wind chimes." And sure enough, the next instrumental section features lots of "wind" – wind instruments of every description, that is, including prominent slide whistles. This frenzy leads into to the ambitious "Fire." Here, rising/falling strings combine with haunting, wordless group vocals to create a convincing sonic impression of raging flames. The flames die out as the instruments fade, leaving only a single drum, followed in turn by layered voices chanting "water, water, water." The chant in turn gives way to "Blue Hawaii" (not the Elvis song!) – which presents a vision of an island paradise grounded more in tourist-brochure marketing than in reality. We've now come a long way from "Do You Like Worms" – from a song whose ominous tympanis seem to foreshadow the coming of the "social structure" to the "Sandwich Isles" – to a song informed by a fantasy-world, tiki-bar sensibility. Again, at its end, "Smile" seems to seek a retreat from reality. A brief reprise of "Prayer" comes next, leading into the grand finale: the hit single "Good Vibrations." Only this isn't the single at all – it's a new version, with substantially rewritten lyrics and a few new musical touches. In its 45-rpm incarnation, "Good Vibrations" is a song about classic boy-girl romance – not too far removed from "California Girls," "Surfer Girl" and other early Beach Boys hits. The "Smile" version, on the other hand, is about "vibrations" in the sense of primal energies and telepathic signals – "she's already working on my brain." Preceded by the "Prayer" reprise, the song reduces to human terms the free-floating spirituality of the album; remember, "Good Vibrations" is only a single letter away from "God Vibrations". "Smile" is a truly pivotal album, a milestone of American pop music – perhaps history will judge it a masterpiece. While its music and lyrics are remarkable (if sometimes uneven), its greatest single accomplishment lies in breaking the traditional song-forms that have, until now, limited the development of rock, preventing it from taking its rightful place alongside classical and jazz. Without doubt, "Smile" will be a direct challenge – and, hopefully, a source of inspiration – to other rock artists. One imagines that the next Beatles album – the album of which "Strawberry Fields Forever" will surely be a centerpiece – will have to explore, to some extent, this newfound structural freedom. Can we expect a Lennon/McCartney album-side suite? Perhaps. And even an artist like Dylan (listening to "Smile" during his lengthy recuperation?) will have to take note of Brian Wilson's accomplishment. It's breathtaking to think what Dylan's incredible lyrical inventiveness might achieve, liberated from the traditional folk/rock verse-chorus structures that have characterized even his most daring compositions. Without question, "Smile" points the way to the next stage in the evolution of rock music. None of this is to ignore or to minimize the album's very real shortcomings. The lyrics are, in places, obscure to the point of inviting a charge of meaninglessness. The conceptual themes that are intended to unite each song-suite – and, one supposes, the album as a whole – are sometimes less than clear...or clearly expressed. And (one must face these things) the lack of a moral center, a social awareness behind the clever words and artful melodies, is occasionally troubling. Perhaps "Smile's" greatest challenge is the challenge it sets for its own creators. If the album points the way for others, then what direction does it set for Brian and the Beach Boys? As the Beatles' music has grown more complex, they have addressed the issue of live performance by taking a (hopefully) temporary sabbatical from touring. Brian has already forsaken the road for the studio; will the rest of the Beach Boys be able to present this music effectively in a live context? In musical terms, will Brian opt for ever-more-elaborate arrangements and orchestrations, moving more decisively in the direction of a Bacharach or a Gershwin? Will he abandon "rock" music altogether? After years of writing with his bandmates, he settled on "outside" collaborators for his most recent (and most ambitious) albums: Tony Asher on "Pet Sounds," and Parks on "Smile." Will that trend continue? Most importantly, will he continue to experiment with new forms and structures? Since standing still is the same as moving backward, the answer must, one feels, be "yes"; but where will that experimentation lead? Pieces that stretch across multiple LPs? Rock "operas"? Almost anything is possible. Wilson, Parks and the Beach Boys have opened up a brave new world for rock music, and time alone will tell where they, and we, will go next. To paraphrase "Good Vibrations": we may not know where, but it will send us there. DISCLAIMER: While the name "ROLLING STONE" is used, this story is a work of fiction and there is no implied connection to the said corporate entity that is RS. The story is copyright Jon Hechtman.